If you like a Hearthstone tournament in the past few years, chances are Gloudas was involved. Hearthstone esports are in a bit of a weird spot. The Hearthstone Championship Tour and all of Blizzard’s first-party events are undoubtedly great. It keeps the esports scene alive all by itself, with a significant number of players now making the game their full-time pursuit. But outside of the Tour, things are a little more bleak. Outside of stalwarts like Seat Story Cup, there aren’t that many other events going on anymore. Gone are the days of Starladder, Kinguin, HPL… the list goes on. Almost every major third-party event has collapsed or pulled back from Hearthstone. That’s where people like Doug “Gloudas” Wreden come in. You might not recognize the name—but if you have enjoyed a third-party Hearthstone event in the past three years there’s a good chance he was involved. He left his job as a programmer with Electronic Arts to work on the Hearthstone Championship Tour for ESL, back when ESL was producing the series as a white label partner. Once Blizzard decided to move on to a different production partner, Gloudas was left with the question—what next? He went on to lead production on the popular Hearthstone Trinity Series team league before joining Tempo Storm and producing the recent History of Hearthstone series. Dot Esports spoke to Gloudas about his journey, History of Hearthstone, and his plans for the future. How did you end up in charge of the Trinity Series? Gloudas: After ESL finished producing the 2016 World Championship at BlizzCon, Blizzard chose to work with a different production company for HCT in 2017, so we suddenly had a ton of bandwidth to work on something new. Right around this time, ESL was in talks with Twitch to partner on an original Hearthstone team league, and since I had been helping lead ESL’s Hearthstone team through 2016, I was approached internally to help design what this new team league would be. I definitely will not claim to be the sole creator of Trinity Series, as there were a number of super talented folks who helped iterate on the format and concept (including Carmac, Charles Watson, Allen Wong), but through a lot of discussion we landed on our core concept: eight teams of three players, with a Last Hero Standing nine-deck format, and team listen-ins throughout the matches. From that point, once the format was finalized and approved by all parties, I was assigned as the team’s producer and helped coordinate all the show’s elements on a high level, including graphics design, getting players on board, writing rules, developing the show’s rundown, music, casters, all that good stuff. And once we got rolling in Season 1 and saw the positive response, things just snowballed from there and it led to a second season after that. How challenging was running a league with teams on that kind of scale? In many ways, running a league with teams is actually easier than running a massive open-attendance tournament like HCT. With a large open tournament, you spend an enormous amount of effort simply planning the management and and coordination of the hundreds of players involved. A tournament on that size has many different variables including internet and webcams, match scheduling, language translation, time zones, rulings on simultaneous matches, etc. It’s very, very challenging and time consuming to wrangle all of these elements in an effective way, and I think Blizzard should get far more credit for how well they do this during every HCT Playoffs. By contrast, in Trinity Series we had 24 total participants (eight teams with three players each) who were all professional, seasoned players—they had reliable internet, webcams, spoke English, had personal rapport with our team, and knew general tournament etiquette. And because it was the same players every week, we didn’t have to contact and schedule an entirely new set of players for each leg of the tournament, in contrast to HCT Playoffs, where the player base is completely different week-to-week. So truthfully, many of the biggest organizational challenges of running a big Hearthstone tournament are eliminated in a league format. That said, it is of course challenging to run any esports tournament, as there are a ton of different people and elements that have to work together to make it all happen. But fortunately we had a fantastic team and studio at ESL, and incredibly funny casters like TJ Admirable and Frodan, so I think we were able to pull it off really well. How did you come to the decision to move on to Tempo Storm? What was it that attracted you to working for them? As Trinity Series Season 2 was ending, Reynad approached me about joining Tempo Storm to help build out their production team. At that point we had worked together on Trinity Series, and on a Hulu show that ESL was developing, so he had seen some of my work. Reynad’s main goal, and the point that he really stressed in our conversation, was that he wanted to develop highly-creative community content. He felt, and I agreed, that there’s a lot of opportunity for unique formats and community-focused events that aren’t really being explored in esports, and that Tempo Storm was in a unique position given their brand and resources to pull something like this off. This whole concept really resonated with me, since I’ve always been drawn to community-run esports events and more generally to anything that’s off-the-wall and different. And because Season 2 of Trinity Series was wrapping up, and I was looking for a change of pace after two years at ESL, it felt like the right time and I agreed to come on board. I’ve been here about six months now and it’s been a fantastic experience. How much freedom do you have to come up with these projects? Quite a lot actually. Reynad gives our production team a ton of freedom and trust to develop the content that we think will be interesting and impactful. It’s a characteristic I admire quite a bit and it’s one of the reasons I sincerely enjoy working for him. We certainly collaborate on our overall schedule and plans, particularly iterating and testing ideas for Hearthstone specifically, but overall I’m given a lot of room to think up crazy ideas and see what sticks. Take us through the whole process of History of Hearthstone—where did the idea come from? How long did it take to come together? History of Hearthstone happened crazy fast in comparison to the bigger shows I’ve worked on like HCT or Trinity Series. Typically it takes months of iteration and discussion on an event’s format and scope and budget, and then another few months to get all the departments to kick off and develop their individual responsibilities for the show, all before the first broadcast even happens. In our case though, we’ve intentionally kept our team small to try to move as fast as possible. I originally came up with the core tournament concept a few months ago, and then worked with Reynad to define the specifics a bit, like which weeks have which expansions. From that point we got the concept approved from Blizzard, and then just cranked it out really quick. Because we’re a smaller team and each wear a lot of hats, we were able to get everything set up and ready in just a few weeks. I personally made all graphics, contacted players and talent, wrote the rules, the run of show, the scheduling, social media graphics, etc. My partner Carlos handled all the tech side of things—getting Skype remote video ready, all video mixer scenes, etc.—and from there we were ready to go for the broadcasts themselves. Are you happy with how that event turned out? I am definitely proud of the event that we created. There were so many fun and compelling moments that illustrated just how multi-faced and crazy—in a good way—Hearthstone can be, and it had a nice burst of nostalgia on top of all that, like seeing Patron Warrior again! I can’t say for certain if we’ll do this exact same format again but I’m definitely appreciative that we were able to create something so unique in the Hearthstone space, since I feel that type of deckbuilding content has been missing recently. And the community seemed to really appreciate the format as well which is super encouraging! That, or they just really, really like Dane [the eventual winner of the tournament]. What are your next big ideas for events? Unfortunately I can’t give away much there! But we definitely are continuing to focus on Hearthstone and exploring new ideas for content, both big and small. What would your dream Hearthstone event look like? Money no object, game restrictions removed, what would you put together? 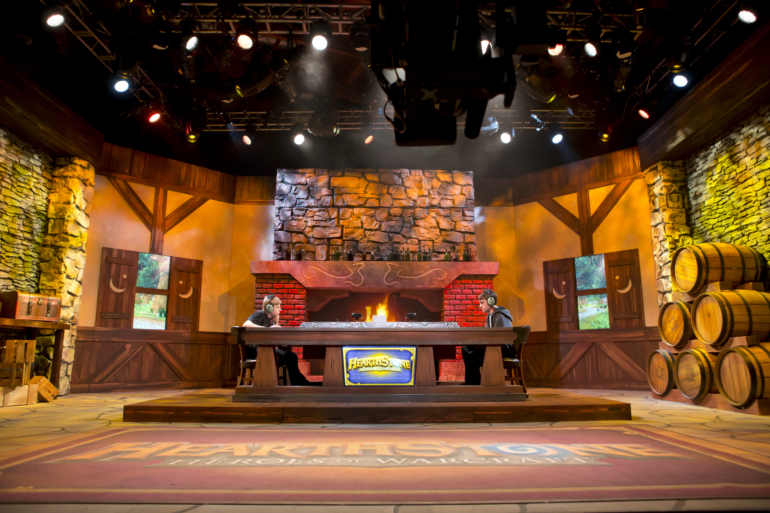 I would love to do a Take TV style tournament, a very relaxed venue environment with heavy player participation and deckbuilding as the primary content. I have a soft spot for Hearthstone deckbuilding formats, even though I’m personally terrible at deckbuilding, and I think that the combination of crazy decks and a crazy venue would create something truly unique.